Daily Prayer is the perfect companion for your spiritual journey. Versatile and easy-to-use, this trusted resource has assisted Catholics in deepening their faith and prayer life for over a decade. 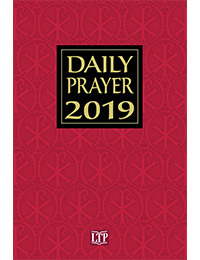 Focus on Scripture each day of the year with Daily Prayer 2019. This easy-to-use resource for group and individual prayer centers on a scripture reading each day, along with a reflection, a psalm, intercessions, and closing prayer. The book provides an introduction to Catholic prayer for those involved in the Rite of Christian Initiation of Adults and an easy-to-use format for Catholics of all ages. It draws on the long tradition of lectio divina, providing a simple order of prayer for each day of the liturgical year from the First Sunday of Advent, December 2, 2018, through December 31, 2019. As the perfect gift for parish volunteers, teachers, and catechists, it will aid each person in the parish to foster a practice of prayer, and can be used to begin or end parish meetings.